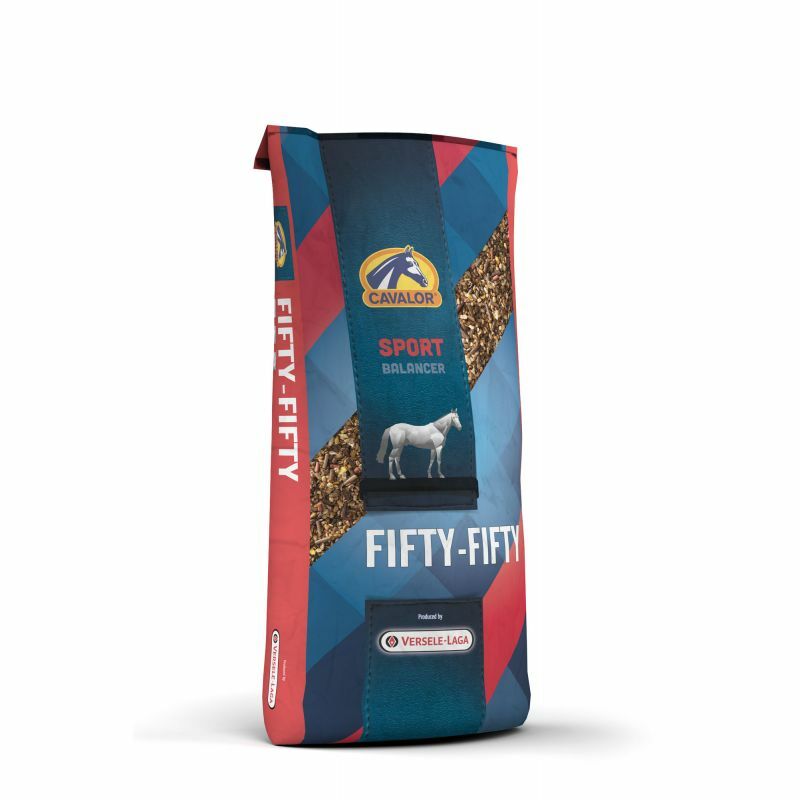 CAVALOR - Heat-treated grains, which are more easily digestible; high-quality, easily digestible proteins; high levels of vitamins, minerals, trace elements and essential fatty acids - 36*20 kg or 500 kg XL box. By buying this product you can collect up to 90 loyalty points. Your cart will total 90 loyalty points that can be converted into a voucher of 27,00 €. Cavalor FIFTY-FIFTY contains all the elements also found in Cavalor Superforce, Cavalor Endurix and Cavalor Perfomix : heat-treated grains, which are more easily digestible; high-quality, easily digestible proteins; high levels of vitamins, minerals, trace elements and essential fatty acids. Thanks to Cavalor FIFTY-FIFTY, you can have the core of Cavalor feed available and add to it your own grains or other raw materials. 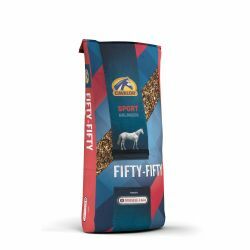 Cavalor FIFTY-FIFTY gives value back to your own available raw materials or gives you a flexible base for your multifunctional stable (for example, a mixture of stud and competition horses). light work - max. 300 g per 100 kg live body weight. medium-heavy work - max. 350 g per 100 kg live body weight. The daily feed ration depends on work, breed and roughage ration. Florastimul supports a healthy intestinal flora, making the horse less susceptible to gastrointestinal upsets. Artri-Pro is a unique copper, zinc and manganese supplement. These micronutrients ensure that the joints, tendons, cartilage and skeleton are given a higher level of support than they would from any regular maintenance mixture. Omega 3 fatty acids : glossy coat, immunity stimulants, inflammation inhibitors, defense against a host of allergies,.... This unique fatty acid composition supports the general condition of the horse.